PNG will join East Timor as the second Pacific island nation to sign up to the initiative, which aims to expand Chinese economic influence by enhancing trade routes across the world. Mr O’Neill said he was pleased with the opportunity of being included in the trade initiative. "That offers great potential for PNG, which means that it will help us integrate our own economy to the global economy," he said. "At the same time we will advance our negotiations for our free trade agreement between Papua New Guinea and China." Beijing was also optimistic about the visit and the prospect of furthering the relationship between the two countries. "Prime Minister O’Neill’s visit to China is an important high-level exchange between China and Papua New Guinea this year," Foreign Ministry Spokesperson Geng Shuang said in a press conference last week. "Over the past 42 years since the establishment of diplomatic ties between China and Papua New Guinea … our bilateral relations have achieved remarkable progress." "China is willing to work with Papua New Guinea to maintain the momentum of high-level exchanges and interactions at other levels, deepen mutually beneficial cooperation in all dimensions, and enhance communication and coordination in international and regional affairs so as to move forward the China-Papua New Guinea strategic partnership." 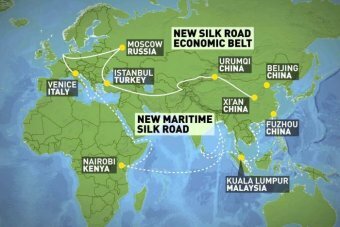 According to the Lowy Institute, China spent $858.4 million on 27 projects in PNG between 2006 and 2016. China’s influence can be seen in the funding of Port Moresby’s new $35 million International Convention Centre, the venue of the upcoming Asia Pacific Economic Cooperation (APEC) summit in November, which will be attended by Chinese President Xi Jinping. China has also been involved in large-scale road projects, building a six-lane boulevard between the convention centre and the nearby national parliament — worth an estimated $40 million — and an upgrade to the Port Moresby freeway. Mr O’Neill said he won’t be seeking any new loans while in China. But, even before this visit, China is Papua New Guinea’s largest bilateral creditor, with PNG owing it nearly $2 billion in concessional loans — almost a quarter of its total debt burden. "We are not here to beg for anybody to give us any money, we want to do business with people, and we will do business on equal terms and equal footing," he said. Mr O’Neill also defended his decision to leave the country after declaring a state of emergency in his home province last week after protesters burned down government buildings and destroyed a passenger plane. During his visit, Mr O’Neill will meet with Mr Xi and Premier Li Keqiang. The Government is planning to renegotiate the funding of the multi-million dollar Pacific Marine Industrial Zone in Madang in the country’s north. At least 19 government officials and another 50 Chinese PNG business people will accompany Mr O’Neill on a specially chartered Air Niugini plane. Mr O’Neill’s visit to Beijing overlaps with reports that Vanuatu’s Prime Minister, Charlot Salwai, will visit Canberra this weekend for the first time to discuss Australian-Pacific relations following a turbulent period in April when media reported China was constructing a military base in the tiny Pacific nation. Mr O’Neill’s China trip also comes as Foreign Affairs Minister Julie Bishop told Fairfax that Australia was concerned about Chinese influence in the Pacific, claiming Australia wanted to be the "natural partner of choice" to Pacific nations. "We recognise we’re not the only partner, but we would like the Pacific to see Australia as providing them with the kind of support that maintains their sovereignty, maintains their economic stability and doesn’t become an unsustainable debt burden," Ms Bishop told Fairfax. Ms Bishop announced on Tuesday that Australia would partner with telecommunications company Vocus to build high-speed undersea telecommunications cables to both PNG and the Solomon Islands. "Australia’s strong support for this project is a reflection of our enduring commitment to the Pacific, where we work with partners to support the region’s stability, security and prosperity," Ms Bishop said in a statement. A similar deal was originally inked with Chinese company Huawei, but the telecommunications giant was forced from the deal when the Department of Foreign Affairs and Trade (DFAT) stepped in to foot the majority of the bill over Chinese influence concerns. But China’s Ambassador to Australia Cheng Jingye told reporters the idea that China was manipulating countries is "absurd". "We have always been sensitive to any possible debt burden and any items that we have in cooperation with those countries, we are very careful about their ability to come back to the debt," he said. Wesley Morgan, from The University of the South Pacific in Fiji, said the type of language used by Ms Bishop also underestimated the Pacific nations. "Sovereignty also involves the ability to make your own choices," Mr Morgan told Pacific Beat. "I think some Pacific Island leaders and officials actually find it offensive to suggest that Pacific Island countries are not capable of making their own choices with regards to infrastructure, finance … and their own development." Economist Paul Flanagan told Pacific Beat he believed PNG was attracted to Chinese investment because they fell short of the economic parameter required for loans from the International Monetary Fund (IMF) or the World Bank. "Sometimes the terms of these loans are much less generous than what PNG should be able to obtain," Mr Flanagan he said. "But unfortunately their macro-economic performance at the moment isn’t good enough for them to be able to reach out to the normal international community so they’re moving towards China instead." After Beijing, Mr O’Neill will visit Shanghai, Zhejiang and Guangdong, according to the Chinese Foreign Ministry.